This sun-drenched estate close to Sciacca in Sicily, is just a stones throw from the beach (7 km). Accommodation is provided in 8 attractive holiday apartments with a further 2 bedrooms on the ground, first and second floors. 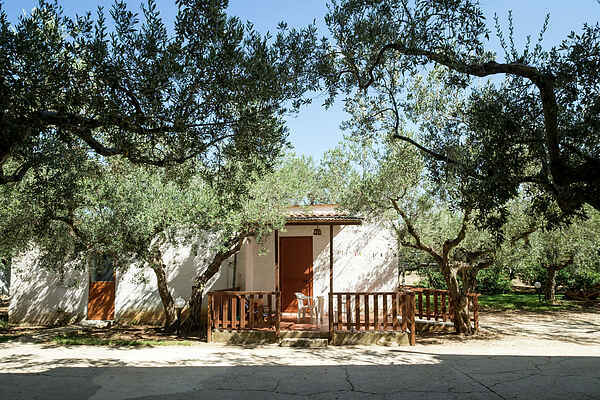 The estate is situated on an extensive cultivated plain with 4 hectares of olive groves, fruit trees and vegetable crops. The recently built apartments have been decorated with colour and practicality in mind. Nearly all come with a balcony/terrace/veranda. Guests also have use of a large communal outside area, with swimming pool and sun terrace. This makes the perfect place for a wonderful Sicilian break and the ideal base from which to explore the rest of the region: the sea and beaches are 7 km away, while the thermal spas in Sciacca (the most renowned on the island) are also well worth a visit. Numerous activities are on offer due to this area of Sicilys rich historical, cultural, gastronomic and folkloric traditions. Within a few kilometres radius you will find the Valley of the Temples of Agrigento, Selinunte, Segesta, Erice, Trapani, Marsala, as well as Mozia Island, the Egadi Islands, the Zingaro reserve and Palermo. Upon request: Reasonably priced breakfast and meat or fish-based suppers, all prepared with genuine, traditional produce. Due to the interior, the accomodation is not specially suitable for young children. Due to the interior, the accomodation is not specially suitable for young children.